Every night since Hurricane Maria hit, Miguel Martinez and his family have slept on mattresses on the porch to escape the heat inside their dark, stifling home. But it's nearly impossible to sleep with temperatures in the mid-80s. At least once a night they climb to the roof to catch a hint of breeze. Then the 51-year-old construction worker, his three children and one grandchild climb back down again. "It's a heat from hell," Martinez said. "We don't have a generator or a fan. We have nothing. The children get desperate. You want just a little bit of cold water, but there's none." 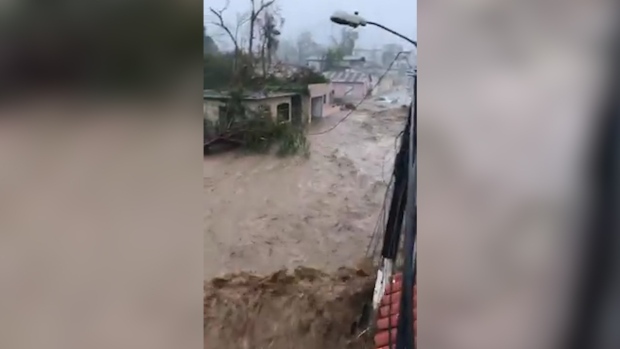 The power is still out across nearly all of Puerto Rico after Hurricane Maria smashed poles, snarled power lines and flooded electricity-generating plants last Wednesday, knocking out a grid that was already considered antiquated compared to the U.S. mainland. Generators are providing power to the fortunate few who have them, but nearly all the island's 1.6 million electricity customers were still without power Monday and facing many, many hot days and dark nights to come. 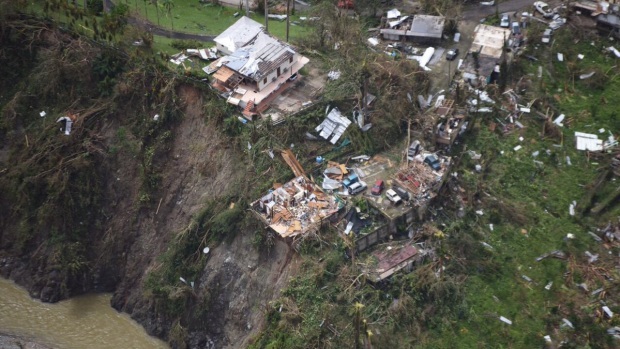 Power had been restored to a handful of hospitals and surrounding areas by Monday afternoon but Public Affairs Secretary Ramon Rosario said it will take months to fully restore power to the island. Authorities are still figuring out the extent of the damage, let alone beginning to repair it. Utility workers from New York have arrived to help assess the damage, while airplanes and barges are bringing in more generators. Getting the power back isn't just a matter of comfort. A long delay will mean even more pain for a Puerto Rican economy that's already reeling from a decade-long recession. With no power, even more people will leave the island to find better opportunities on the mainland and further drain its workforce. The downed power system is also damaging the tourism industry, which contributed 8 percent to Puerto Rico's economy last year. The overwhelming smell of rotting garbage wafted through a working-class part of the Santurce section of San Juan, where 46-year-old construction worker Rafael Santana spent the night in front of a single fan thanks to a neighbor with a generator who was kind enough to throw over a cable so he could have power from 8 p.m. to 7 a.m.
By 8 a.m., Santana's forehead was beaded with sweat as he left home to seek out some shade nearby. Roberto Ruiz, a 50-year-old handyman, handed a chilled bottle of water that his daughter brought home from her job, which has power, to a neighbor seeking something to drink. "Look at this! Cold water!" exclaimed 70-year-old Jose Luis Burgos as he took the bottle and looked at it, mesmerized. "We are suffering here." Ruiz said he jumps into the shower several times a day to cool off, letting water drip over his body instead of drying off afterward. He also leaves his windows open, which led to another problem: "Now the mosquitoes don't leave me alone." Most people have thrown open their doors and windows, anxious to feel a breeze amid the oppressive heat. Six-month-old Rafshliany Cortijo wore only diapers as she sat in a swing placed in an open doorway. She smiled as she slowly swung back and forth. "I bathe her six times a day," said Franchesca Rivera, the baby's 31-year-old mother. "She sweats a lot." 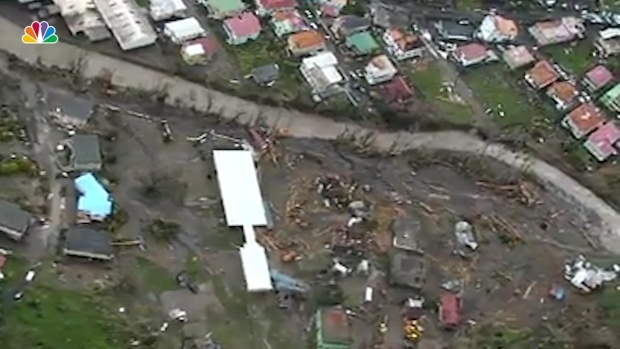 Aerial footage above Dominca shows the damage from Hurricane Maria across the island. Mother and daughter sleep on the porch at night along with Rivera's son to stave off the heat since they don't have a generator or a battery-powered fan. Nelida Morales, a 49-year-old nanny, said her house becomes an oven during the day because three big trees that once shaded it were uprooted by the storm. "We can't go to the rivers because of floodwaters. And the beach is out of reach," Morales said as sweat beaded on her upper lip. Puerto Rico's power plants were not severely damaged, according to Gov. Ricardo Rossello. 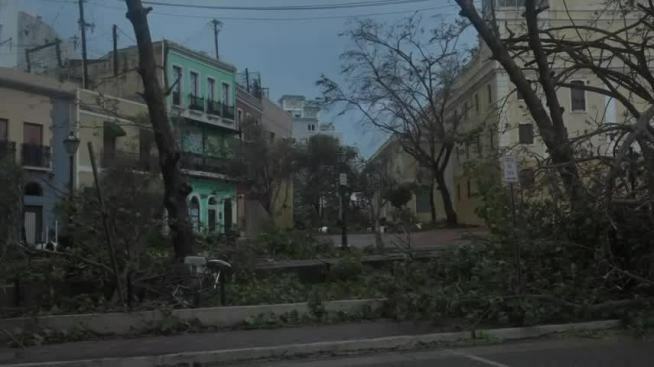 However, 80 percent of the island's transmission lines are down, and Rossello said it would take up to two years to completely rebuild the infrastructure under normal conditions. He said the plan is to restore power with some quick fixes to the network and then gradually strengthen it to avoid problems like blackouts and make it less vulnerable to future storms. The Puerto Rico Electric Power Authority, or PREPA, has more than 2,400 miles of major transmission lines and more than 30,000 miles of smaller distribution wires that connect homes and businesses to the grid. Much of the network is down. Officials hoped to use helicopters and drones to get a better look and help them decide where to send repair crews first. Unlike Texas and Florida, where Hurricanes Harvey and Irma knocked out power grids this summer, workers from other utilities on the U.S. mainland can't hop in trucks and drive to Puerto Rico. By Monday afternoon the main airport in San Juan was not yet operating normally, which is slowing the airlift of crews, generators and other equipment. Even before Maria hit, the power authority said it needed more than $4 billion to upgrade its infrastructure after years of under-investment left it with an inefficient and unreliable system. Its fleet of power plants has a median age of 44 years; the average age across the United States is 18 years. The power authority already had more than $9 billion in debt when it filed for what is essentially bankruptcy protection in July. It was weakened by the island's long recession, which sapped demand for electricity, but it also struggled to collect hundreds of millions of dollars in unpaid bills. Last year, consultants hired by the Puerto Rico Energy Commission wrote a scathing report about the power authority, noting that outages occurred four or five times more often than at mainland U.S. utilities because of a history of neglecting maintenance. "It is difficult to overstate the level of disrepair or operational neglect at PREPA's generation facilities," wrote consultants from Synapse Energy Economics in Cambridge, Massachusetts. They said that frequently there were "simple failures that blossom into crises."